Waynesville is evidence a city doesn’t have to be large to host a serious craft beer culture. In the last year, three microbreweries have tapped a refreshing suds scene that offers bold flavors and small crowds. Clark Williams, owner of Frog Level Brewing Company, suggests taking a day to appreciate the beers at the trio of operations brewing in the handmade tradition of Haywood County, known for its arts and crafts. “We’re trying to build some pride in another local trade,” he says. At Frog Level, Waynesville’s first brewery, the malted beverages taste even better when you’re relaxing on the back deck of the historic brick edifice Williams chose to house his production facility and tasting room. The long, narrow space exits to a grassy plot under locusts and sycamores along the bank of Richland Creek. It’s a great setting for sipping the marquee Tadpole Porter or a pint from the “rare keg” featured each month, such as the Autumn Harvest ale flavored with local honey and apples. 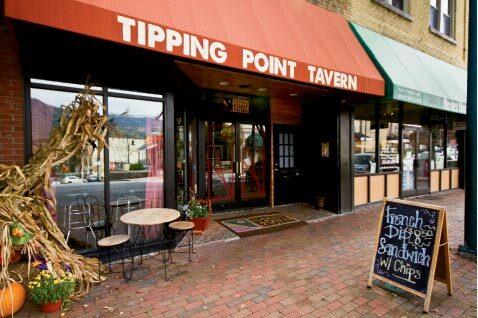 Several blocks uphill, co-owner Tony Rogers of Tipping Point Tavern left the golf business to tee up another passion. Rogers and his partners opened a neighborhood pub and eatery on Main Street in 2010, and this summer added a lineup of hoppy brews, including the Chunky Gal brown ale and Punch in the Face IPA. And while Headwaters Brewing Company may be a bit tricky to find, you’ll be glad you sought it out. Beer lovers will be impressed by the chummy backyard vibe, complete with a basketball hoop, retro beer can collection, and a friendly black Labrador named Gypsy. On tap is a wickedly tasty house-made root beer for the youngsters and a lineup of river-themed brews, such as the Stiff Paddle IPA and Angler’s Amber, that will surely add to the tradition of locally made greatness for which Haywood County is famous.